The Kickstarter for Shadow Throne, Nothing Sacred Games’ next big release, is right around the corner! Over the next several months, you’ll be learning a lot about the game and its development. To kick things off, I thought I’d spend a little time describing the design goals that helped inspire and guide the development of the game. What are design goals? Design goals are high level objectives a designer has for a game. Sometimes, these have to do with theme. Sometimes, they have to do with mechanics. Sometimes they’re about components. They almost always deal with the experience of the player. And while they don’t always limit what the designer will allow in the game, they usually should. A while back, I discussed the design goals for Fungus, a game I spent many months working on. (Fans of Fungus shouldn’t worry… the game isn’t forgotten!) Today’s treatment of Shadow Throne will follow in that article’s footsteps. Let’s get the basics out of the way first. 30-45 Minutes. I shoot for this time range for almost all of my games these days. Why? Because you can have a pretty serious experience in this length of time, but it’s not prohibitively long. It’s satisfying, but still appropriate in many situations. 3-5 Players. For Fungus, I wanted to allow 2 players to enjoy the game. For Shadow Throne, I was ok with upping the minimum number of players. Allowing for 2 players would be awesome, but handling 2 players can greatly limit how a game can work. So I’m content with a 3 player minimum. Note that I originally wanted a maximum of 6 players for the game, but after playtesting it quickly became clear that 6 players is just too chaotic. While disappointing, I wasn’t devastated to scale back the player count goal to a max of 5. 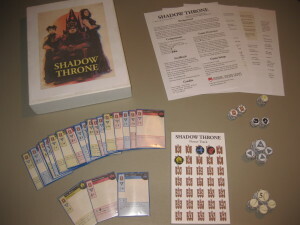 An older prototype of Shadow Throne. You can pack a lot of fun into a small number of cards. 54 Cards. One sheet holds 54 cards, which is how I came up with this constraint. I have heard that modern printing techniques aren’t limited to sheets of 54 cards, but I still find it a good goal. Having some limitations on components is essential–otherwise, component count tends to creep ever higher, until your game is cost prohibitive, not to mention bloated. Even having a card limit doesn’t stop other components (like tokens) from getting out of control. $25 price tag. Corporate America taught me to live within my means. (Pretty strange lesson to learn from that game, actually.) I wanted to keep my next game cheaper, so players don’t have to risk as much money on a game from a publisher and designer without much name recognition. On top of that, I want to keep the cost of printing the game very low so the Kickstarter goal can be more manageable. So far, we’ve discussed practical, boring goals. While they’re still very important, it’s time to get to the fun stuff: the structure of the game and player experience goals! Drafting. I’ve gone into great detail about how sweet drafting is, and Shadow Throne is my next venture in exploring the kinds of games drafting can support. Shadow Throne falls squarely between 7 Wonders, where players immediately play every card they draft, and Magic, where players draft entire decks of cards before playing the actual game. In Shadow Throne, players draft hands, then play those hands out before drafting again. After spending months working on Shadow Throne, I discovered there is another game, Fairy Tale, in which players draft hands and then play them out, making this aspect of game a little less unique. Despite that similarity, though, the games play very differently. No turns. I’ve talked before about the ideal of simultaneous action, and I took this goal seriously with Shadow Throne. There are no turns in the game at all. Players draft simultaneously (nothing new), and play their cards out simultaneously. The big design challenge here was making sure that no special abilities require choices. The choice of which card to play is the only choice a player makes in almost all cases. Though this does limit the types of abilities that are available, it also proved to be a refreshing design challenge, forcing me to think outside the box to come up with original abilities that are simple but interesting. No direct attacks. This follows pretty naturally from the last goal, but I want to keep players from directly attacking other players. Of course, indirect attacks are great, and if a player can anticipate what her opponent will play and counter it, more power to her. Inspirations. Shadow Throne has many inspirations. I already mentioned drafting of the 7 Wonders and Magic style. But another one of my favorite games, Citadels, also inspired the game. Citadels also involves drafting, but of a very different style than Shadow Throne‘s drafting. Where Citadels really inspired Shadow Throne is in the value of information, the opportunities to bluff, and the benefits from anticipating your opponents. The drafting in the game gives you the opportunity to see what your opponents might do, and your job is to find the counter and play it at the proper time. While the game ended up being a little more chaotic than Citadels, it also ended up being more fast paced and accessible, which I’m more than OK with. 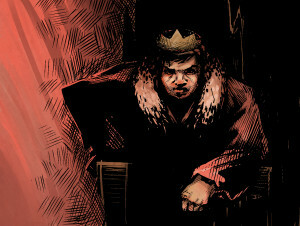 I want players to feel like all characters, including the powerful King Kyros, are mere pawns in their struggle for power. No alligiances. Shadow Throne is mostly a mechanically inspired game, but there is one thematic inspiration: I want players to feel like they’re using the characters in the game. I want them to abandon one team without hesitation if it looks like that team isn’t doing well to join the winning side. I will be the first to admit that I was reading a lot of Game of Thrones when the idea first struck me, and was especially taken by the characters Varys and Littlefinger. If you enjoy the book series or TV show, I think you’ll be very happy to see some overlap with Shadow Throne. 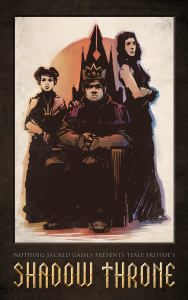 The Shadow Throne Kickstarter is right around the corner, and I for one couldn’t be more excited! 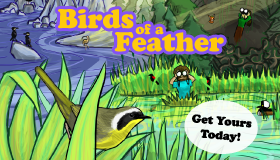 I’ve been working on this game for a long time, and I’m really happy with how it’s turned out. Today I focused on the design goals I set out for myself when I started working on the game, but Shadow Throne is more than a one man project. I have a great team, and I think you’ll find that the whole game has come together extremely well. Before signing off today, I just want to re-iterate how good an idea it is to set design goals if you’re working on an original game. You don’t always have to be totally explicit with your goals, and you shouldn’t stick with them slavishly (ultimately, playtesting may prove that one of your goals is a bad idea, or that two of your goals are incompatible), but giving yourself some structure right from the beginning of the design process can really help you focus and stay on track. When designing a game, you’ll make about a million tiny decisions. Each may seem small, but all of them together determine what your game will become. By adopting design goals to help you make those decisions, you can make sure that the decisions are all consistently working together, resulting in a much more coherent final product. Ok, that’s it for now! Stay tuned… I’ll have more about the development of Shadow Throne soon!